Well friends, here we are again - Monday. Doesn't it feel like the last Monday wasn't all that long ago? Anyhow, the weather is a bit confused in this area (70 degrees last week, 60 degrees on Saturday, in the 40s and windy yesterday, calling for the temperature being in the 40s today with possible snow flurries, and up to 70 again by Thursday) so I am a bit confused about how to dress. Winter? Spring? A little bit of both? I have to say the one great thing about taking on a 30 for 30 challenge is that you don't have to worry too much about picking out an outfit because it's crafted from a fixed set of items. It becomes a bit more daunting when facing an entire wardrobe. Maybe this overwhelmed-every-time-I-open-my-closet-door-feeling means I have too many clothes to choose from? Hmm...Or maybe it just means I am out of practice because I have been in 30 for 30 mode lately. Yeah, that's probably why. Well, I hope everybody had a great weekend and that your weeks are off to a great start. Here's to Monday! Ooh - I love this outfit! The necklace peeking out under the collar is so cute. And I'm so glad you mentioned it's supposed to hit 70 on Thursday again - I was getting seriously depressed about dipping back into highs of the 40s. I am with you on the weather. I am ready for the two days of spring we usually get in this area :-). Thanks Preethi! I love the detail in your pants. 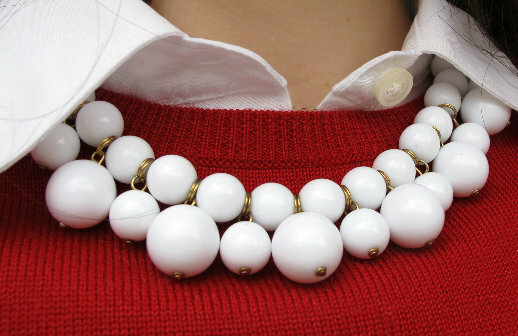 I also love the red sweater and red shoes and the pop of white with the necklace! Overall a lovely look! Thanks Beth! The necklace was a late add-on, but I am happy I did. I think it pulls everything together nicely. Happy Monday! Thanks Mandy! I was actually thinking of getting rid of the sweater and the pants but I thought I would wear them one last time before I did. Now I may hold on to them a little while longer. Thanks again! 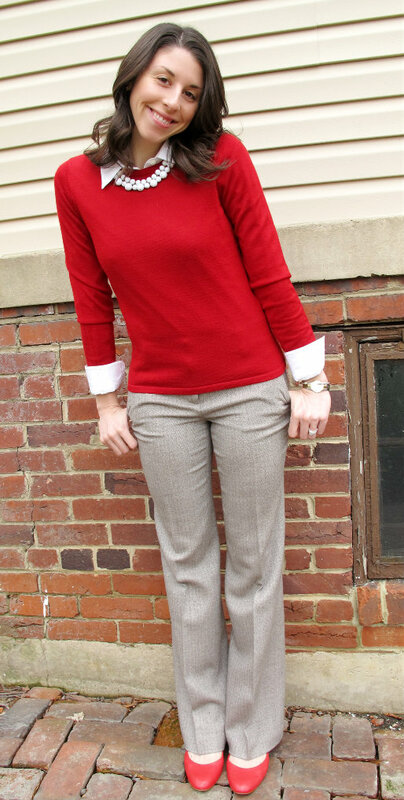 I love the red sweater paired with the neutrals, very professional look! Your necklace is so gorgeous too! The weather is crazy here too in Jersey...it's in the 40s now and supposed to be 60s later this week. It's driving me nuts! Thanks Sharon! Hang in there...just a few more days until spring-like weather. Have a great Monday! 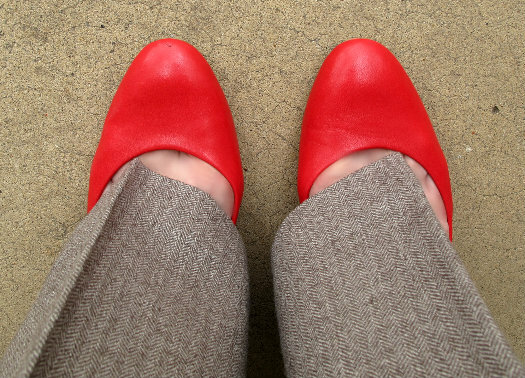 I love the red! And those pants look amazing on you! Perfect outfit! You look beautiful! I love everything about this outfit. So cute! LOVE that this looks straight out of an Ann Taylor catalog! Seriously - you look beautiful and so so sweet!